I do have 4 more scarves woven, but haven’t taken their pix to show you. Soon. Be patient. Spending time with my family. Helping mom out with school done, I’ve taught the 6-almost-7-year-old to make gods eyes. We also started making a potholder, but he wasn’t into it. It’s still on the potholder loom but I doubt he’ll ever finish it. Next day, when it was raining, I took him to see a movie – Incredibles 2 – and to lunch. There’s also been just hanging out and general family fun. With yesterday as my son’s birthday, there was a delicious dinner. I was responsible for dessert and since he wanted something cold, I browsed a few recipes and made this frozen chocolate dessert. I’m not recommending it. I bought high quality Green & Black Chocolate, 1 milk and 2 dark varieties since both my kids prefer dark chocolate. The dark was too…bitter? hard? Just too much. We all liked the milk section best. I put crushed ginger snaps between the layers, thinking it would add to the taste, but it mostly made things fall apart. That being said, I’m sure we should have let it sit at room temperature for a bit before cutting and eating it. Oh well. I’ve also spent days doing this. I saw a cherry tree laden with fruit on my early morning walk. I went back at a reasonable hour and knocked on the door. Was the homeowner going to use all the fruit? “Nope, help yourself,” he graciously replied. Although I didn’t weigh it, I’m guessing this was roughly 12 pounds of sweet cherries. Interestingly, these cherries didn’t have anywhere near as much flavor as those I buy in the store. I made a batch of mini pies, which didn’t look anywhere near as pretty as these, although they tasted fine. I brought one back to the nice man with the tree. Then I made a batch of no-pectin jam. I used cherries, cranberries, and a whole lime, including the peel, chopped fine. It jelled well, but there are too many cranberries and too much lime, so the taste isn’t what I was aiming for at all. Too tart and bitter, despite lots of sugar. A few days later on a different route for my walk I noticed another heavily laden cherry tree, these cherries tart and much more flavorful. Again, later in the day I drove back and asked if I could pick some. “All you want,” was the response. So I picked more cherries. This time I weighed them, and it was over 10 pounds, with my container not as full. (The kindle is there for relative size of my picking container.) I made another batch of no-pectin jam, this time with cherries and apples. Hmmm. It turned into a lovely cherry-apple sauce/spread, but certainly not jam. I also made some cherry topping to go on the frozen chocolate dessert. THAT was good! I brought a pint of the cherry-apple sauce/spread back to the homeowner, who suggested I was welcome to bring a ladder to get more cherries if I wanted. 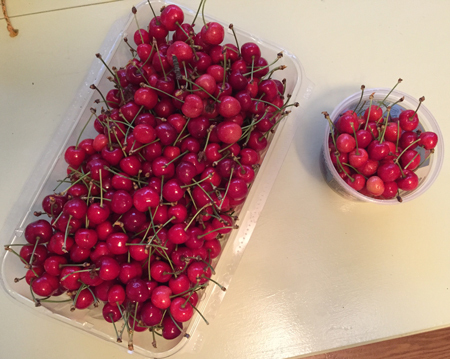 I wasn’t quite into that, but did pick another batch of cherries, this time around 6 pounds. 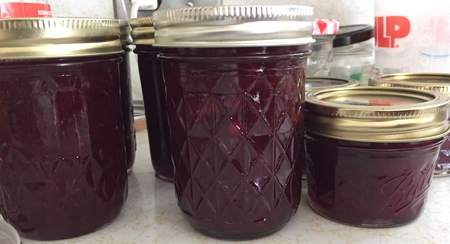 I made a delicious batch of regular old cherry jam with SureJell. Of course it set great and tastes lovely, if very sweet. I need to get some low-sugar pectin. I also made it a point to warp up my little counterbalance loom with a 16/2 linen warp for a transparency, which I’ve been wanting to make since I took a class well over a year ago. Honestly, preparing the cartoon was a very time consuming process. Or so I thought. Until I started weaving the sample. THAT is SLOW weaving! It has lots of colors and yarns since I wanted to try out various weights and textures before I set about doing the ‘real’ piece. Here’s what it looked like just the loom. I’ve woven in all the ends here, but it’s before any wet finishing. My inlay yarns include 1, 2, and 3 strands of 8/2 cotton; 1 strand of 8/4 cotton; 1 strand of 8/4 cotton along with 1 and 2 strands of 8/2 cotton; single strands of cotton chenille in various weights; 1 strand of rayon boucle; 1 strand of cotton flannel, and tapestry wool. It’s okay, but I don’t like the ‘stripes’ you can see in the warp. I have a 12-dent reed and needed to set the threads at 10 ends per inch. I was anxious to see if that would even itself out in the washing and pressing process, so did that ASAP. Here’s the piece stuck on my bedroom window with masking tape – classy, huh? It hasn’t been pressed yet, but you can get a better idea of the finished impact. I’m happy to know that the background linen threads all moved to create an even web. Now I know that I have to modify my cartoon. First of all, I made it on the back of some old wallpaper I’ve used for warp packing. Only to learn via the sample that it is really too thick for this purpose. Second I learned that I prefer the look of the ‘crisper’ yarns; 1 strand of 8/2 cotton is too thin, 3 a bit too thick, 2 is Goldilocks just right for me. The wool may work fine, too, except that I only used it in my smallest rose, which makes it hard to determine how it would be in the larger rose. The chenille and flannel don’t suit my purpose. 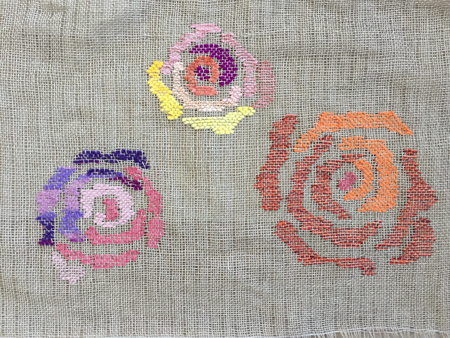 Finally, I learned that my smaller roses (the one that’s yellow and purple in the image) are too small to be worked well. Really only the biggest one looks good. Sigh. So I’m going to sit on this for a bit and think about how I want to proceed. Oh, yeah. And I learned that the long, loom-woven, rayon chenille piece I wove for that Crafting Democracy exhibit was accepted. Yay! But now I have some work to do…more and better photos, and some more writing, by early August. No rest for the weary. Maybe not weaving but productive none the less. I canned up some strawberry lemon preserves, but have been no where near as ambitious as you yet. Love the transparency testing. WOW – have you ever been busy!!! 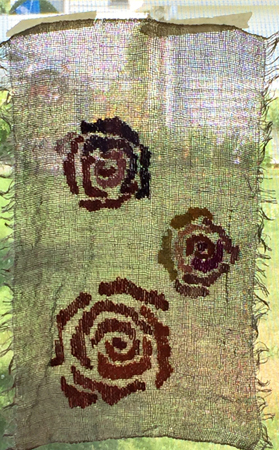 The weaving is intriguing – I can easily understand going all the way across a row, but doing the roses pretty much puzzles me. If I were embroidering it with a needle, OK.
Cherries – what a successful job you did at finding and making use of overlooked resources! 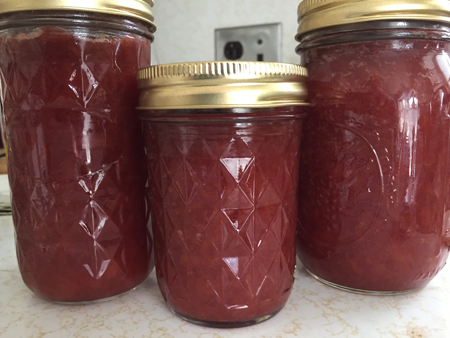 Question – why did you not use pectin at first? Is someone sensitive to it? Were you just going natural? So, Alma, I didn’t use pectin in the first batch because I knew that the cranberries had enough natural pectin. In the second batch I thought the apples would supply sufficient pectin – I guess I didn’t have the right variety. Love the transparency and look forward to seeing ur project in motion. I was a lucky recipient of a cherry tarte and it was yummy! Thanks, Jennifer. You’re always receptive to my kitchen and studio efforts.